Belgaum(now Belagavi) is one of the oldest, strong, prominent and well cultured historical place, nestling high in the Western Ghats. The old town area with cotton and silk weavers stands gloriously besides the modern, bustling, tree-lined British Cantonment. Step out of the forts and you have a wide choice of temples and churches to visit. Belgaum has an enviable heritage and offers much to be discovered. It lies in the zone of cultural transition between Karnataka, Maharashtra and Goa with a known antiquity clearly traceable up to 2nd Century A.D. Due to its proximity with the states of Maharashtra and Goa, Belgaum has acquired the cultural flavor of these states and blended it with the local Kannada culture to create a rich heritage, which is unique in its manifestation. It is also known as Malenadu or Rain Country and the vegetation here is verdant green throughout the year. Well, centuries have passed and today it is an entirely different story. Belgaum has now become one of the important and considered districts in the state of Karnataka. Belgaum is now marching with a tag of fast growing, redeveloping district with a population of approximately over 5.5 lakhs. The name Belgaum is originated from “Velugrama” or “Ikhsugrama“. The earliest mention of this is made in the Nesari Plates of 805 AD. The archaeological inscriptions under A Sunder in the Vadgaon – Madhavapura area reveal a prosperous town of the Satavanhana times. Chalukyas and Rastrakutas administrated the territory. Later on Kadambas of Goa and Rattas ruled Belgaum. It was made the capital city under the Rattas. Afterwards Yadavas of Devagiri and Vijayanagar rulers governed the city. In 1472 AD Bahamani’s conquered Belgaum. The Adilshahis of Bijapur captured it in 1489. Asad Khan a noble of Bijapur, ruled Belgaum from 1511 to 1540. His tomb is in the camp area. In about 1550, Sherkhan a Bijapur coommander built the present town Shahapur, originally called shahpet. Shivaji, the Maratha ruler in 1673 came to Belgaum. The Mughal Emperor Aurangzeb defeated the kingdom of Bijapur and then he transferred Belgaum to the Nawab of Savanur. In 1756, Belgaum was conquered by the Marathas. It was under the Maratha until it was occupied by the British in March-April 1818. The British made it the headquarters of a Sarkar (District) with 15 paraganas (Talukas) in 1838. The British experienced the heat and chill of the 1875 Revolt in Belgaum also. A leader of the Revolt was sentenced to death at the Military Dairy. He was Nargund Baskar Rao alias Babasaheb. His ‘ Samadhi’ is located at the Military Dairy. Foreigners have left behind their indelible impressions of Belgaum. Ralf Fitch (1583) calls the place “The first town between Bijapur and Goa “. Geographer Ogliby (1680): remarks as one of the four eminent castles in Konkan. Italian traveler (1695) calls it a populous city and a place of much trade with a large market. Belgaum was one of the five military stations that were established in the Old Bombay Presidency. In 1878, it was made the headquarters of the Southern Division under the Bombay Presidency. 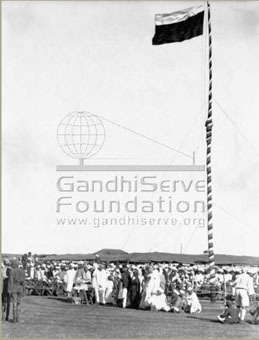 Belgaum hosted the 1924 annual Congress session which was presided over by Mahatma Gandhi as the president. It assumes greater importance as it was the one and only congress session held in Karnataka as well as presided by Mahatma Gandhi as the president. Asad Khan Darga Photo courtesy Aziz. Places like “YELLUR” Fort etc also have a significance.The details are most welcome if given. Around and nearby there are a number of places and landmarks of historical importance and great significance. “Patwardhans” Who were Sardars of “PESHWAS”.Someone can come out with the details since I have none. Hi sir.r u from belgaum? From 1981 onwards city is adding one or other mile stone in its progress. Growth Of #Hydrolic Industry along with traditional Foundry & M/Cing. Engineering colleges, Technical University VTU. # RaniChennamma University , #BIMs #MedicalUniversity #secondCapital with #SuvarnaVidhanaSouda #Aviation SEZ #SugarInsititute #sugarBoul Of #Karnataka more tn 20sugerIndustries, many are under construction #vibrant real Estate growth. Two full pledged Golf playing facilities Of 18 holes . Nice information about Belagavi, Karnataka…. Thanks to Brahmanand Chipre for beautiful narration of not widely known facts about Belagavi. There are many historic monuments inside the Fort. These may please be studied and shared. I am from Belagavi ( in fact from nearby Yamakanamardi) stayed in Belagavi till 1969. When I was a student, I used to study for my exams sitting in Jain Basadi in the Fort, such a calm place. I used to visit Ramatirtha behind Kanbargi. Wonderful days. I also thank Mohammed Naveed for the spirit of unity denied to the communities by the poltically vested interests. Very nice.. Thank you for sharing such an intersting history. Salute, to Brahmanand Chipre for this information. To the management responsible. 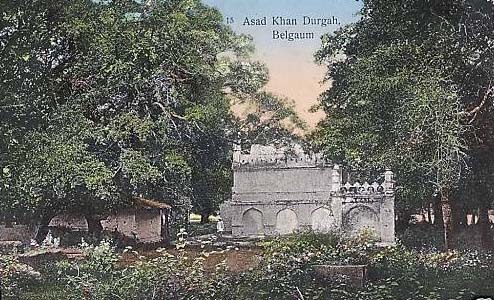 I AM SO HAPPY TO KNOW ABT BELGAUM AS I AM FROM BELGAUM ORIGINALLY..I AM A PERSON WHO HAS GREAT RESPECT TOWARD HAZRAT ASAD KHAN BABA AND MORE OVER MY HOME IN BELGAUM IS NOT MORE THAN 1 KM.THAN DARGA.THE PICTURE ON THIS SIDE IS A TOO OLD PICTURE ABT THE DURGA..IF U ALL CAN SEND A CURRENT PICTURE OF ASAD KHAN DARGA I WILL BE THANK FULL TO U ALL. it is The revolt of 1857 (And not 1875)originated due to the divisive rule of the British. They wanted to divide the Hindus and Muslims and rule. So they started with the army. They started giving the firearm cartridges covered with the fat of the cow to the Hindus, the ones covered with the fat of the pig to Muslims. The grenades have to be opened by mouth. This started hurting the sentiments of both Hindus and Muslims who were aware of the ideas of British. So they revolted. Now Hindu and Muslims are being divided by our politicians and both the communities want only 1 thing peace and good living and good shelter…But due to some politicians and wrong persons words people are fighting with each other and finally there is nothing yielded for either community and they have to goto Jail for some days and our beloved politicians will enter here to take them out but background is they are the culprits who does this because of their benefit. SAD but if everybody thinks and acts smartly then our belgaum will become as it was during its Golden Days. I appreciate your views Naveed. This made Excellent reading ..Thank u AAB , Brahmanand Chipre for collecting and publishing this valuable information.